In 1950, Rohrer raised the question as to the location of the border between the Northern and North Midland dialects. He cites the investigations of Stead (1906) and Sheard (1945) whose opinions as to the siting of the boundary differed (see map). Having conducted his own research in the area encompassing both boundaries Rohrer found that, although both Stead and Sheard had each drawn his border more or less accurately, each had not only used different criteria but also failed to state clearly what they were. Rohrer concluded that there is no clear cut demarcation between the dialects of the NER and the WR but rather a broad belt in which the inhabitants use, in Rohrer's words, a 'buffer dialect'. That is to say that they will use a Northern form for one word but a North Midlands form for another. Rohrer cites as an example Whitgift near Goole where he encountered the North Midland forms for stone and spoon [stoo-an, spoo-in] but the Northern forms of throat and mouse [throo-at, moos] (Rohrer, 1950: 29, 33-5). Wakelin (1977: 105) attributes this blurring of boundaries to phonological loans between dialects and the influence of Received Pronunciation. Furthermore it should be noted that the border between the North and North Midland dialects is not static. There is evidence to suggest that the latter has been moving northwards for some time (Rohrer, 1950: 35). Ellis, S. (1992) 40 Years On: Is Dialect Dead? In Transactions of The Yorkshire Dialect Society, Vol. XVIII, Part XCII. 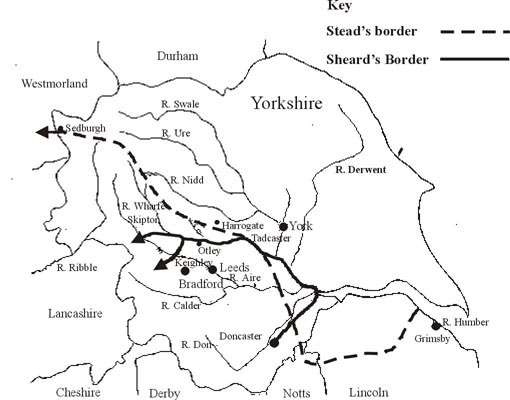 Rohrer, F. (1950) The Border between the Northern and North-Midland Dialects in Yorkshire. In Transactions of The Yorkshire Dialect Society, Vol. VIII, Part L.
Wakelin, M. F. (1977) English Dialects: An Introduction, Revised Edition, London: The Athlone Press, University of London.